8, Gulmohar Duplex, Ivory Tower, Besides Dainik Bhaskar, South Civil Lines, Jabalpur - 482 001, M.P. Procedural accidents leading to complications such as canal transportation have been ascribed to inapt cleaning and shaping concepts. Canal transportation is an undesirable deviation from the natural canal path. Herewith a case of apical transportation of root canal resulting in endodontic retreatment failure and its management is presented. A healthy 21-year-old young male presented discomfort and swelling associated with painful endodontically retreated maxillary incisor. Radiograph revealed periradicular radiolucency involving underfilled 11 and overfilled 12. Insufficiently obturated 11 exhibited apical transportation of canal. This type III transportation was treated by periradicular surgery and repair using white mineral trioxide aggregate (MTA). Comfortable asymptomatic patient presented uneventful healing at third and fourth month recall visits. A decrease in the size of radiolucency in radiograph supported the clinical finding. In the present case, MTA is useful in repairing the transportation defect. The result of these procedures is predictable and successful. Endodontic mishaps are unfortunate occurrences that can occur during treatment. Failure to grasp the rationale behind cleaning and shaping concepts can increase the incidence of procedural complications such as blockage, ledge formation, apical transportation and perforations. According to the Glossary of Endodontic Terms  of the American Association of Endodontists, canal transportation is defined as follows: Removal of canal wall structure on the outside curve in the apical half of the canal due to the tendency of files to restore themselves to their original linear shape during canal preparation; may lead to ledge formation and possible perforation. Various undesirable apical preparation outcomes such as damage to the apical foramen,  elbow formation,  zip formation and perforation  have been described as possible results of canal transportation. Perforation represents a communication between the root canal space and the external root surface, causing irritation of the periradicular tissues. Zip formation adopts an elliptical shape at the apical endpoint. Similar terms describing the shape of a zipped apical part of the root canal are an hourglass shape,  a teardrop  or a foraminal rip. Zipping is caused by using progressively larger and stiffer files to working length. It can result in a poorly cleaned root canal, which fails to provide a resistance form to compact gutta percha, and leads to obturation which is vertically overextended but internally under-filled. This contributes to leakage, infection and failure. Type 1: represents a minor movement of the position of the physiologic foramen, resulting in its iatrogenic relocation. Type II: represents a moderate movement of the physiologic position of the foramen, resulting in a considerable iatrogenic relocation on the external root surface. In this type, a larger communication with the periapical space exists, and attempt to create a more coronal shape may weaken or perforate the root. Type III: represents a severe movement of the physiologic position of the canal, resulting in a significant iatrogenic relocation of the physiologic foramen. Apical transportation is managed by differing in the specific treatment strategy. Canals exhibiting type I transportation can be cleaned and obturated, if sufficient residual dentin is maintained and shape created above the foramen. Type II cases are managed by placing a barrier to control bleeding and provide a backstop to pack against during subsequent obturation procedures. In type III situations, a barrier technique is usually not feasible; it requires obturation as best as possible followed by corrective surgery. A healthy 21-year-old young male presented with the intention of seeking relief from discomfort and swelling associated with a painful endodontically retreated maxillary central incisor. Previous occlusal radiograph, before any endodontic intervention, was available. Medical history was non-contributory with no record of systemic disease. Five months ago, he had undergone root canal treatment for the resolution of a lesion of endodontic origin associated with 11 and 12. Lesion did not resolve and persisted even after retreatment one month back. Clinical examination revealed non-carious, discoloured, tender 11 and incisally fractured non-tender 12. Periradicular area of 11 and 12 was inflamed. Firmly attached overlying mucosa presented a healed sinus opening in periapical region. Softness to palpation indicated loss of buccal cortical plate over root apices of 11 and 12. Teeth were firm. Periodontal probing assessment was within normal limits. IOPA radiograph, obtained at the time of visit, exhibited periradicular radiolucency involving insufficiently obturated 11 and overfilled 12. Apical tearing associated with 11 was categorized as type III transportation. Lesion warranted surgical periradicular debridement along with sealing and repair of transportation. Patient consent was obtained. Periradicular curettage and removal of extruded gutta percha, after raising a mucoperiosteal flap under local anesthesia, exposed the apical canal transportation of 11. Repair of this canal defect by packing a wet sand consistency mix of white mineral trioxide aggregate (MTA) (Angelus, Brazil), with distilled water, restored it. Cold compaction by a ball burnisher, after removal of overextended gutta-percha, sealed the root apex of 12. Subsequent to reapproximation, flap was stabilized by suturing. Flap displayed firm attachment at suture removal review. Comfortable asymptomatic patient presented uneventful healing at third and fourth month recall visits. A decrease in the size of radiolucency in IOPA radiograph supports the clinical finding [Figure 1]a-g and [Figure 2]a and b.
Endodontic treatment in dentistry is a delicate procedure and many treatment attempts fail. It is important to understand the objectives for shaping and cleaning the root canal system. The factors associated with an increased risk of canal transportation include insufficiently designed access cavities, use of inflexible instruments, instrumentation technique, insufficient irrigation during mechanical enlargement, degree and radius of a canal curvature, unseen canal curvatures in two dimensional radiography and experience of operator.Canal transportation may result in inadequately cleaned root canals, over-reduction of sound dentin and destruction of the integrity of the root. Mineral trioxide aggregate is the material of choice for managing various undesirable apical preparation outcomes. It has been extensively evaluated , for microleakage, marginal adaptation and biocompatibility. Investigations have shown that, it can conduct and induct hard tissue formation. , This bioactive material most closely meets both physical and biological requirements. The sealing ability of this non-absorbable material is not adversely affected by blood contamination. Fluid present in the periapical tissues provides sufficient moisture for it to set. Cementum grows adjacent and onto this radiopaque material, thus allowing for a normal periodontal attachment apparatus. In this case, MTA was used to repair apical transportation defect, as it has above-mentioned advantages over other materials. Apicoectomy or root-end preparation was avoided as it would have further removed the sound dentin. Many endodontic complications, including canal transportation, can be prevented while cleaning and shaping. Apical transportation may lead to post-operative flare-up, surgery and extraction. However, depending upon the extent of occurrence, it can be managed. In the present case, MTA was useful in repairing the transportation defect. Postoperative clinical and radiological findings support the choice. The outcome of this case, indicate that the result of these procedures, is predictable and successful. 1. American Association of Endodontists Glossary of Endodontic Terms. 7 th ed. Chicago: AAE; 2003. 2. Hu¨lsmann M, Peters OA, Dummer PM. Mechanical preparation of root canals: Shaping goals, techniques and means. Endo Topics 2005;10:30-76. 3. Weine F, Kelly R, Lio P. The effect of preparation procedures on original canal shape and on apical foramen shape. J Endod 1975;1:262-6. 4. Peters OA. Current challenges and concepts in the preparation of root canal systems: A review. J Endod 2004;30:559-67. 5. Young GR, Parashos P, Messer HH. The principles of techniques for cleaning root canals. 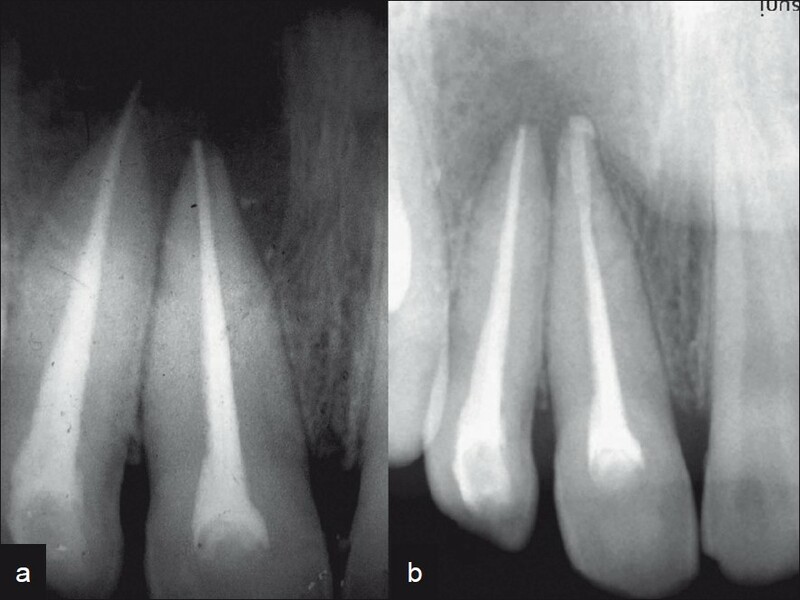 Aust Dent J Endodontics 2007;52(Suppl.):S52-63. 6. Gluskin AH, Peters CI, Ming Wong RD, Ruddle CJ. 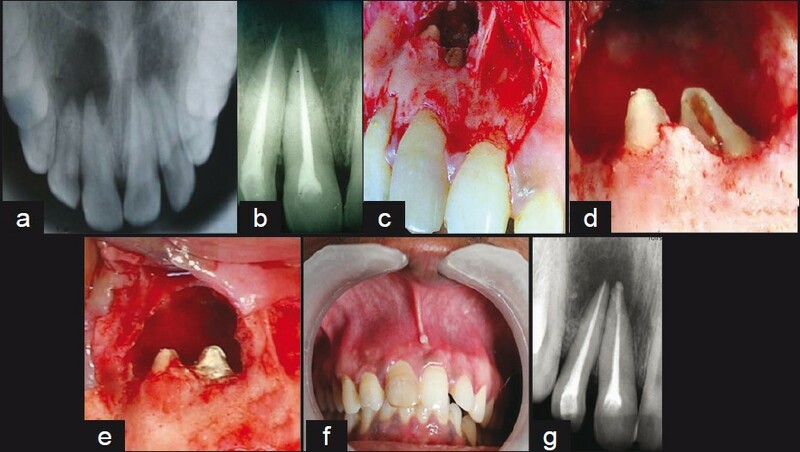 Retreatment of non-healing endodontic therapy and management of mishaps. In: Ingle JI, Bakland LK, Baumgartner C, editors. Text book of Endodontics. 6 th ed. Hamilton, Ontario, USA: BC Decker; 2008. p. 1088-61. 7. Camilleri J, Pitt Ford T. R. Mineral trioxide aggregate: A review of the constituents and biological properties of the material. Int Endod J 2006;39:747-54. 8. Parirokh M, Torabinejad M. Mineral Trioxide Aggregate: A Comprehensive Literature Review-Part III: Clinical Applications, Drawbacks, and Mechanism of Action. J Endod 2010;36:400-13. 9. Kim EC, Lee BC, Chang HS, Lee W, Hong CU, Min KS. Evaluation of the radiopacity and cytotoxicity of Portland cements containing bismuth oxide. Oral Surg Oral Med Oral Pathol Oral Radiol Endod 2008;105:54-7. 10. Pelliccioni GA, Ciapetti G, Cenni E, Granchi D, Nanni M, Pagani S, et al. Evaluation of osteoblast-like cell response to Proroot MTA (mineral trioxide aggregate) cement. J Mater Sci Mater Med 2004;15:167-73.